First up in our “Best of 2013” is “Pipe Dreams” by Randall Martoccia. “Pipe Dreams” was 2013’s fan favorite. Set in the early 1980s and loved for its recollection of a popular head shop in small North Carolina town, Pipe Dreams really struck a chord with folks who grew up in Greenville. Enjoy! Mom’s shop was called Pipe Dreams. It sat along the main stretch of stores in downtown Greenville, beside Mike’s Bike Shop and across from Heart’s Delight, an ice cream parlor. Pipe Dreams was not a dark and seedy place — hard to be dark when two of your walls are plate-glass, hard to be seedy with a colorful rendering of the caterpillar from Alice in Wonderland (nicknamed Utokia by my mother and her friends) painted on your door. Mom sold a wide assortment of things — posters, buttons, tee shirts, costumes at Halloween time — but drug accessories were her most consistent money-maker. When the Drug Paraphernalia Law went into effect on October 1, 1981, making the selling of bongs illegal in North Carolina, Mom knew the store would never survive. She tried hard, but the store had lost its focus. In the final months, she sold, or attempted to sell, Rubik’s cubes, board games, and suede cowboy hats, which became an emblem of the store’s aimlessness. Pipe Dreams closed down less than a year after the law went into effect. Pipe Dreams as it was. She kept Pipe Dreams running for three years, a good record for any business in downtown Greenville. Looking at the bars along Fifth Street today, it is hard to imagine children playing there. Things were different then. 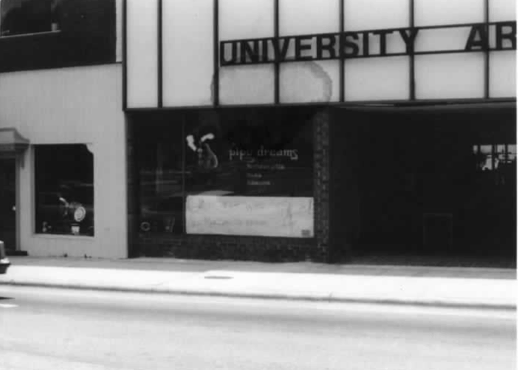 In the late seventies, downtown Greenville was a rich playground for my friends and me. Within a block of each other were the already mentioned ice-scream shop, Barrel of Fun, an arcade; Hodges, a sporting-goods store; and the Book Barn, a kid-friendly bookshop. However, Pipe Dreams was one of our favorite haunts. The bongs lined up on the shelves looked as harmless as vases, so we ignored them. Instead, we pinched each other with roach clips, yukked it up over the “Ayatollah Assahollah” tee shirts and the posters of Steve Martin with an arrow through his head or Frank Zappa with his pants around his ankles. We thumbed through exotically titled magazines —like High Times or Heavy Metal—looking for a breast or two. Mom had no problem with us hanging around. In addition to keeping me within sight, our presence in the store seemed to amuse customers. I think that a few ten-year olds running around made first-time customers feel more comfortable about being in a head shop. We helped to make Pipe Dreams look and feel like a normal shop, which was how Mom always considered the place. As she explained to a campus reporter in 1981, “It’s simply a store and I sell the things that people request.” Mom, I believe, oversimplified the purpose of Pipe Dreams for that reporter, but how do you describe things like friendship and camaraderie to a newspaper reporter? Sure, she showed great joy over the October windfalls (from Halloween costume sales), but she never showed much anxiety over the store’s usual limited successes and ultimate diminishing profits. And how could Mom say that the main reason she kept the store going was so she wouldn’t be lonely in the afternoon? She couldn’t have told him these things without sounding just as flaky as people expect an operator of a head shop to be. She may have been a lousy entrepreneur, but she was not a flake. I’m sure she mystified a lot of people back then. One of my favorite photographs shows her smiling in front of her store. She wears a white blouse with a navy-blue knee-high skirt and a matching neckerchief. Her blond hair is short and swept to the side. She favors Angie Dickinson from her Police Woman days. She’s 36 in the photo but looks years younger. Mom did not look like the stereotype of a head-shop operator. She also did not have a background that one might expect from someone in that line of work. My mother grew up on a dairy farm outside of a Rocky Mount in a strict Southern Baptist household. She graduated East Carolina College in the mid-1960s and, while the drug revolution took hold in parts of the country, she raised my older brother and me. When I started going to kindergarten, Mom got a job as an X-ray technician. Then she tried to sell real-estate. “I’m too honest to be a real-estate agent,” she’d say, and the mere three houses she sold during her entire tenure prove that selling houses was not her calling. In 1979 she and two friends launched Pipe Dreams. Soon afterwards, she bought out her co-owners. Pipe Dreams was her baby. Mom often said that eastern North Carolina was about ten years behind the country when it came to marijuana use: late ‘70s Greenville was no late ‘60s Haight Ashbury. Truth is, even when Mom could sell bongs, Pipe Dreams barely broke even. The traffic of customers was never busy enough to interrupt the almost-daily games of Scrabble. When they did come in, the customers — most of them college students — usually took more of an interest in Mom and Max, her part-time worker, than in any of the inventory. Some customers became regulars. They’d hang around Pipe Dreams for hours just taking turns talking and listening. My friend Colin and I would drop by the store just to listen to the torrent of words. Here, grownups talked like real people. They censored none of their racy jokes for us. They treated us with respect, something that teachers and other parents failed to do. Colin and I liked Max most of all; he told the best, dirtiest jokes. If we liked Max the best, then we liked Beaver second best. Beaver was a dog; his name came from his stumpy, paddle-like tail (and not because he smelled like one, as Max once cracked). He used to sit in Pipe Dreams all day long and stare at the goldfish that Mom kept in a bowl near the window. Mom would lead him out at closing time and would find him curled up in front of the door when she opened the store in the morning. Beaver stunk like hell from bathing in the river. His hair was knotty and matted, like a Rastafarian’s, and hung down in front of his eyes. He became Pipe Dreams’ biggest attraction. 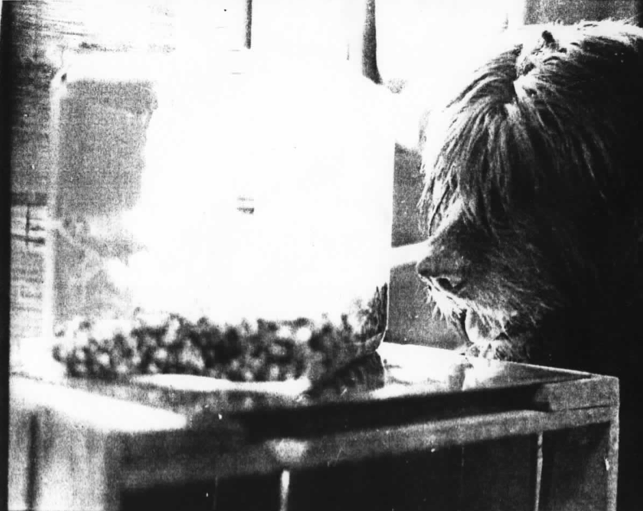 People walking along the sidewalk would see Beaver through the front window — sitting up on his front paws, looking into the fishbowl — and would just have to come in and meet him. My friends and I would stop in just to look at Beaver quietly contemplating the fish. He never barked. He never acknowledged the gawkers. He just stared. To us, his eyes seemed to hold wisdom. There was even a legend going around that, at night, Beaver presided over canine congregations. My friends and I believed that legend and knew to respect that dog. Even though Beaver made our hands stink, we never refused to pet him (once I even brushed the hair out of his eyes and kissed him on the forehead), and we never complained about the smell that stayed on our skin for hours afterwards. Beaver the dog (far right). Goldfish (left). Colin’s parents would never have let him hang out with me if they knew we were spending so much time at Pipe Dreams, so he never told them. Colin’s parents were not unique, as those of most of my friends disapproved of Mom and her shop; I could see it in their faces. Even though the parents in my neighborhood probably supported Mom’s right to sell paraphernalia (my neighborhood, across the street from the university, was mostly liberal), they still did not want their children near “that kind of element.” When I went into their homes, they kept an eye on me. When I acted politely, they were pleasantly surprised. Wow, they probably said to themselves, look at that boy rise above his family. Colin’s parents were the most suspicious of the lot. Mr. and Mrs. Todd had had seven children before Colin, and their ideas of the right way to raise a child were settled. They almost never let Colin and Owen, his older brother, spend the night. I suspect that Mrs. Todd resented the fact that her son spent so much time at my house. That Mr. and Mrs. Todd were the last customers of Pipe Dreams is a fact I still do not quite understand. In the months before Pipe Dreams closed for good, Mom watched as the store shriveled up around her. As she stopped ordering products to replace the inventory being sold, shelves cleared, the display cases emptied, and racks lost their shirts. Then she sold the shelves, the display cases, and the racks too (one of the cases going to the Greenville Police Department, much to my mother’s amusement). What she failed to sell was moved on June 30, 1982 into our living room. As for me, my attention was focused mostly on the former contents of the drink machine. 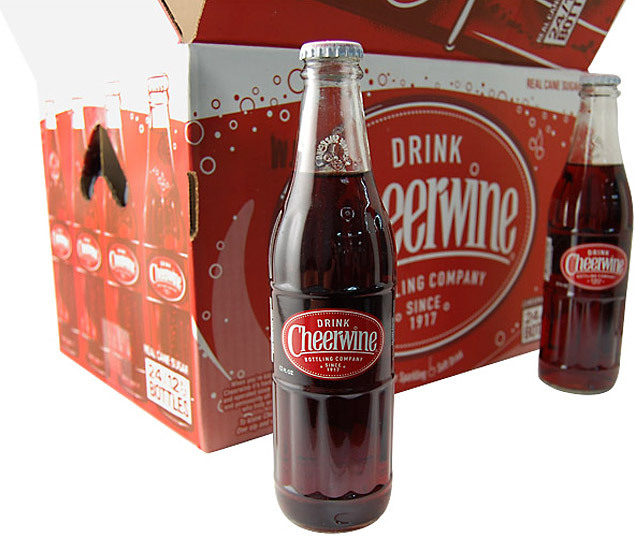 I had never seen that many cans of Cheerwine at one time. Yard sales followed in the weeks ahead. The heap shrank, sure enough, but was still large enough in November to threaten our traditional arrangement of the Christmas tree. Mom got desperate. She had Dad ask his students if they wanted any comic books or tee shirts. I was told to look out for any potential customers of cowboy hats. Seeing the hats, all dozen of them stacked one on top of each other in a column in the living room, constantly reminded Mom of how questionable her business sense was. Although the custom-made hats were nice — suede, leather band, protruding feather — cowboy hats were just not fashionable in Greenville in 1982. Another problem was the price. Mom bought the hats for twenty dollars a piece, and her pride wouldn’t let her drop below that to get rid of them. I told friends about the hats, even had them tell their parents about them, but I explained to Mom that she shouldn’t get her hopes up: “Greenville just ain’t cowboy country,” I told her. Then one week before Christmas, we got a phone call. It was Mrs. Todd, Mom said, and she’s coming over. Mrs. Todd had never come over to our house before, and I was scared. (Hell, she rarely even phoned our house, except to tell Colin to come home). Before I had time to worry, the front doorbell rang. Mom made me get the door. I opened it and was shocked to see Mrs. Todd and Mr. Todd and Buzzy and Sean and Colin and Sarah and Ruth and Rosie and even Michael Doyle, Colin’s nephew. They’d come for the hats. Mr. Todd bought all of the hats that day: one for him, one for Mrs. Todd, one for each of his kids (even Mary and Dennis, who weren’t there), one for Michael Doyle, and one for I-don’t-know-who. Mom and I stood at the front window. She held Mr. Todd’s twenties in her hand, smiled at me, and felt not a bit like a parasite. We watched the Todds make their way down the street, walking in single file. “Look,” Mom said, “it’s Papa Duck and Mama Duck and all the little ducks,” and we laughed at that image of them, even as the last pieces of Pipe Dreams bobbed down Fifth Street on their heads. 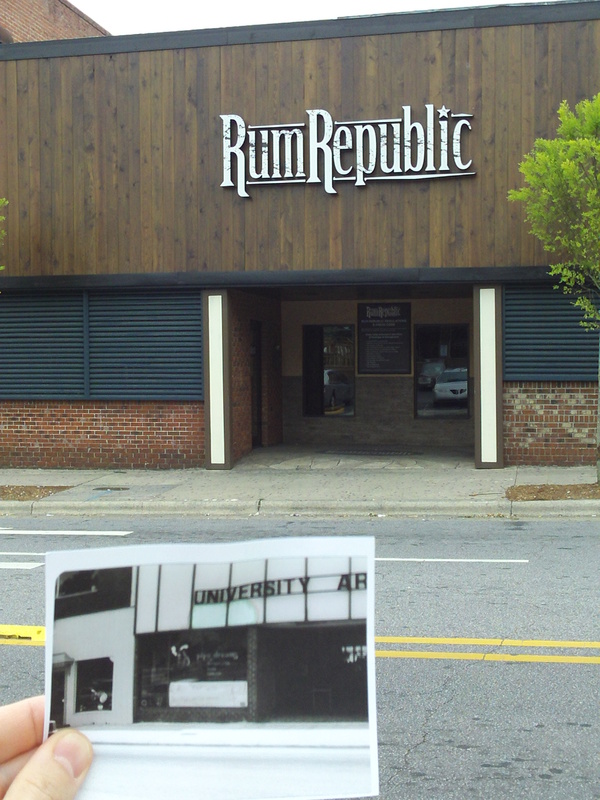 This undergraduate haunt stands where Pipe Dreams once nestled itself into downtown Greenville, NC society. Randall Martoccia teaches at East Carolina University. He writes short stories and poetry and produces short films, which languish on YouTube, thus far failing to distract a high number of the nation’s office workers–his goal, as an anti-capitalist. He is considering adopting a cute cat to boost viewership. His wife Christie disapproves of the cat, but his daughter Mira and two dogs are warm to the idea. Great work. Reminds me of our headship in the mall of my hometown: Expressions. The Zappa poster especially! This was definitely our most popular post of all time, partially because Randall is a marvelous storyteller but also because loads of folks in Greenville, NC (where Randall and I both live) grew up with this shop and have really fond memories of it. We’re excited to be reposting it! I don’t know about the cat idea, but the story is wonderful. Go Mom! great story randall. i remember your mom’s shop also and loved stopping in to say hi to her. i also remember beaver. as a kid in the neighborhood, i concur……it all seemed normal to me. i don’t think i even realized it was a head shop as a kid. the same with donna t’s, magic mushroom shop. i didn’t have money as a kid back then, except for candy, but all the shop owners in downtown greenville let kids come into and hang out. we all did it, when we tired of chasing each other through the art building and found ourselves closer to downtown than to home. all the shop owners were friends to us, your mom included.